SVG Working Group (WG) has demonstrated considerable willingness to collect input from the community about the sorts of features that the language should contain to best support the needs of its user community. Like its cousin, HTML, SVG has a most remarkably divergent set of user needs. Given its emphasis on material displayed on planar devices, and given the intrinsic importance of spatial relations in the presentation of content using a spatial metaphor, SVG's user community may be expected to grow to embrace and support more diversity even than HTML, which at its core is (with the exception of the <table> element and possibly other elements related to spatial arrangement) 1.5 dimensional: that is, its fundamental metaphor consists of written speech (text), with occasional embedded belches of multimedia (<object>, <img>, <audio>, <video>) plus graph theoretic cross-references that provide a modest foray into translinearity. The text -- a linear sequence of characters with occasional pictures. The hypertext -- words and pix in sequence with references. SVG has every bit as much semantic and pragmatic reference to meaning as HTML, it is every bit as hypertextual, but its core metaphor for expression is the plane rather than the line. As such it has come to attract, already, artists, physical and social scientists, and mathematicians whose needs for expression transcend the ability to belch static frames generated elsewhere into an otherwise translinear stream of text. For this community, multidimensional space is not the occasional 2D painting on the wall of an otherwise 1.5 dimensional hypertext, rather for n>=2, n- dimensional space is home. So, without appearing to dump a giant chunk of work onto the WG*, I'd like to suggest that we have some discussions about new classes of effects for the SVG spec, under a couple of provisos: 1. let's realize that these are not responses to a candidate or current draft and 2) spec writers usually prefer it when users structure the discussion of needs in a vocabulary and syntax that spec writers themselves use: use cases, disambiguation, validation, ontologies, and so forth. That is, if we can make our needs clear, document how or why the current spec doesn't do something, provide multiple situations (use cases) in which the feature could be useful (to the arts or sciences -- while recognizing that usefulness can mean very different things to different communities) , and perhaps, even suggest how the syntax of the feature might be expressed, then in such a case, the IG might reach consensus that a given feature be recommended to the WG for inclusion in "a future spec." The reason for saying "a future spec" is that, as I understand it, the W3C requires rather extensive amounts of work from a WG depending on the stage at which a given current spec is in its progression from draft to recommendation. I don't believe it would be in anyone's interest to derail any progress currently underway. We like SVG! A syntactically similar notion is the <superpath>. Like the <contour> it has <path> elements within it, but those path elements are never closed by z in their "d" attribute and represent the different borders that a given region might share with its neighbors (as in a geopolitical map). It is likely to be used both for map processing, graph theoretic purposes (like diagramming), animation, and for layout (that is more flexible than the HTML table or its CSS counterparts since it affiliates regions, connections and boundaries of arbitrary partitions of the plane).. The way it works is this.In the default case, we build a shape by interpolating between two other shapes as in Illustrator (circa 1988) when you'd tween between two bezier curves. The tweening lays down, in sequence a series (of size "steps") of new path elements moving from the background to the foreground. Those path elements are rendered on screen, and inserted into the DOM., so that the <contour> expands the DOM declaratively. Inkscape provides this functionality under "effects" / "generate from path" which one can experiment with easily. Illustrator provides it under Object / Blend. If the number of control points in each path is identical, then the tweening happens on the natural correspondence. Otherwise if one shape has n control points and the other m<n. then the mapping happens between the division of n into M subpaths of equal length (as measured by the same algorithms that give us path.getPointAtLength ). Currently, any concept of "proximity" or adjacency (as in regions that share a border) within SVG must be defined using script. It is the premise of this proposal, that allowing markup to convey the sense of a spatial relation between two SVG objects is not only useful, but applicable to several areas, and ultimately liberating to programmer and non-programmer alike. This is used to either facilitate animation of separate parts of an object, to easily define a class of part-whole relations, or to define a sequence of boundaries that define regions, as in a map, or tabular layout. We introduce the "superpath": that is, the union of a series of subpaths, in which those subpaths may, in fact, be shared between multiple ("contiguous") superpaths. The one-dimensional junction of two superpaths converge is their border, and is typically, a <path> consisting of exactly one "M" subcommand. The zero-dimensional junctions, or point, where three or more superpaths converge is called a "node". A collection of superpaths is called a map. The incidence matrix (or boundary matrix or adjacency matrix) of a <map> is uniquely specified by the pairs of <superpath>s within the map that have shared subpaths. 1. A <path> element in a superpath must not have a "z" path command at the end of its "d" attribute; it is not a closed path. 3. by default, a <map> is of type "map"
Several superpaths together in a collection are called a <map> which is either of type "map" or type "graph". might be a typical usage. 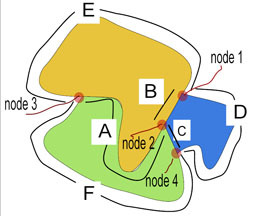 When, for the map containing a collection of superpaths, type="graph" the concentration is on the linking structure provided between nodes or points. In the above diagram, the graph defined, would be the geometric dual of the map, so that this map (informally used to mean a group of superpaths) would in fact define the graph K4 (4 nodes all connected pairwise). 1. Allowing the author and user to zoom in on borders of regions of maps without having to specify huge levels of precision when the we zoom to close levels of details and still have regions borders zoom accurately. The presentation by Li, Yan (School of Computer, South China Normal University) "An Extension of Spatial Functionality for SVG Specification" at SVG Open 2008 made a fairly compelling use case. By way of extending this functionality for cartographic purposes, see also the footnote (a) that follows this section on making text disappear declaratively as we zoom out. (a) On allowing text to scale "properly" at several layers of zoom. For the cartographer, textual information (like letters and symbols in languages like English or Chinese) do not always scale properly. At one level of zoom (for example a view of northeastern China) we may only be able to see Beijing, Shijuiazhuang, Tianjin and Huhehaote displayed because of the minimum size required for the characters to be legible and the size of the map. At another level we may see Lanqfang, Tangshan, and Zhangjiakou as well. Still closer we may see the districts Fangshan, Shunyi and Changping. The ability to describe this through markup rather than script, it seems to me, is desirable. Something like <text zoomdetail="5">Changping</text> and <text zoomdetail="1">Beijing</text> would allow the browser to "know" at what levels of zoom, these labels should appear and at what levels they should remain invisible. This is not difficult to do with script, but a very large part of the charm of SVG is that it allows many such details to be handled by markup rather than script. (See also the <replicate> below). I remember writing a paper in grad school about the syntax of such declarative drawing languages (there were a couple at the time -- maybe Herb Simon (H. A. Simon, “Complexity and the Representation of Patterned Sequences of Symbols,” Psychological. Review 79 (1972):) and later Seymore Papert defined one as I recall in Logo). My recollection of what I concluded is that isolation of the primitives was subjective and that no objective work on which of several distinct axiomatizations actually worked best for humans had been done. The progress in empirical work in such heavily theoretic areas has I suspect been largely neglected by researchers who would rather build things than study humans. However there are a class of smooth planar four regular graphs that as neural networks are sufficient to drive computation in two space (with only a trit of memory per processor) and the drawing of those graphs would be awfully nice if it could be done somewhat declaratively. Consider something so simple as a regular octagon. And suppose we wish to do such through markup. 200 341.4 100 341.4  29.3 270.7  29.3 170.7 z"
Wouldn't " M 0 0 (Move forward 100 units turn right 45 degrees) repeat 8 z" is a much simpler construction for programmer or non programmer alike than to actually calculate the irrational coordinate positions. I note that Inkscape's "effects" menu has a lot of the sorts of things I may be thinking of here. A simple microformat (is that the right word?) could be developed that would be easy to implement and would expand the expressive power of mathematicians, artists and animators alike. Basically, it'd be sort of like the use of <use> in http://srufaculty.sru.edu/david.dailey/svg/ovaling.svg but defined on parts of curves rather than objects. The primitive operations should include rotate, translate, scale, but also reflect (invert the markup point sequence description from left to right), fragment (shake or permute a given sequence), randomize, smooth and fractalize (to a given degree). The ability to insert random numbers into our SVG without script is likely to be very important, I think, to the arts community. that would lay out copies of <object> on a page? The number of copies and their positions and attributes would be determined by the property lists (including keyTimes which now becomes keyPlaces?) associated with each attribute. 1. Knowing the color of a particular pixel on the screen. If we could do that then we could not only apply convolution filters to bitmaps to display high contrast edges, but then we could convert the edges back to vectors. I understand that there are potential security issues associated with giving scripts the ability to take pictures of the user’s screen, but Opera 9.0 seems to have implemented a getPixel and setPixel method that allows interrogating and setting pixel values for arbitrary pixels within a <canvas> object in the HTML environment. If we wished to enable desktop image analysis to be done in the browser, then access to pixels will be pretty important. 2. The ability to deform an arbitrary quadrilateral into another arbitrary quadrilateral (as with the distort tool in Adobe Photoshop™). The affine transformations allowed within SVG 1.1 and 1.2 allow scaling, translation, rotation and skew, which together offer mappings between arbitrary pairs of parallelograms. If we wished to be able to do the morphing of one bitmapped image into another, quadrilateral distortion would seem to be handy. To build something like the "liquefy" filter in Photoshop would likely rely on mesh-based distortions that fall outside the affine transformations currently recommended. 4. Gradients of varieties other than just linear and radial To create smooth transitions of fill patterns across a variety of shapes or with more than two colors is likely to involve a more complex specification for gradients (such as mesh gradients). To piece together segments of linear and radial gradients to approximate omni-directional gradients has been compared by some to making smooth curves out of line segments – possible, but tedious. *The IG has made a helpful effort in that direction already with the decision to publish "the book" (representing maybe a person-year's worth of effort) and the WG has demonstrated a strong sense of cooperation as well. ** There is a sort of physics to layout. Containers have volume (as given by their contents); containers have adjacency. Operations on the resizing or repositioning of elements have implications on the pressure and tensile properties of those contents. For example if we have three polygons meeting at a point and each is filled with a combination of text and graphics, the volume of that content will affect the ways that the containers can be reshaped. Think of the content as fluid, that is somewhat compressible. Text has limits beyond which compression is not allowed. Graphics have rigidity which affects how much deformation is allowed; while text tends to flow more easily (in the general case), so long as individual characters do not deform too much. a flexible geometry for the planar interrelationships of content, and a fairly easy way to introduce a computationally lightweight physics to allow for the resizing and positioning of contents so as to preserve constraints on how different content may be displayed. Some pictures can move in x-y but may not be rotated. Others can be deformed but must maintain verticality. In some cases, like in morphing from one scene to another, we wish local deformations to be negligible, for edge/boundary constraints to be preserved, but other than that the content (a bitmap or vector graphic) is quite fluid and stretchable and can deform to fill whatever curve it is poured into (while minimizing turbulence). In some cases we want a string of characters (like the name of a river) to remain quite close to the boundary of a region (whose border is defined by that river). The notion of deforming a liquid graphic through a volume-preserving and proximity-preserving deformation from any simple closed curve to any other provides a rather flexible metaphor for the class of possible nonrigid transforms. The advantage of such a metaphor, I think, is that it is intrinsically declarative – the user specifies what the beginning and end shapes look like – the computer figures out the rest. Hence it is much in the spirit of SVG itself! This may or may not be along the lines of what the WG has been discussing; I must apologize for not being a better listener, since I got so excited about putting a physics into this little graph theory (one of my favorite topics) so it may be that the direction you are going is even more general, or that it is considerably more practical, but if <superpaths> can be used for animation, map/boundary encoding, and graph theory, then squeezing page layout out of it would just be icing on the cake! I think as we scale diagrams down to smaller devices with differing aspect ratios, the demands on scaling placed by our semantics, can at least partially be represented by a simple physics.